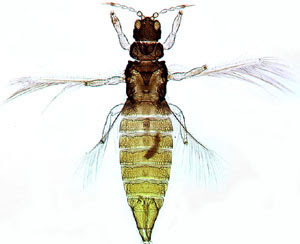 Thrips (Order Thysanoptera) are tiny, slender insects with fringed wings (thus the scientific name, from the Greek thysanos (fringe) + pteron (wing). Other common names for thrips include thunderflies, thunderbugs, storm flies, thunderblights, and corn lice. 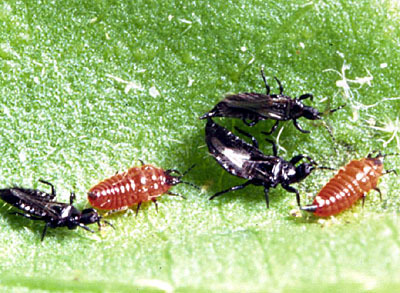 Thrips species feed on a large variety of sources, both plant and animal, by puncturing them and sucking up the contents. 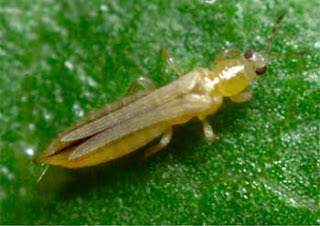 A large number of thrips species are considered pests, because they feed on plants with commercial value. 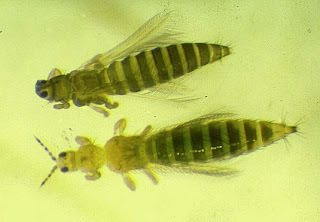 Some species of thrips feed on other insects or mites and are considered beneficial, while some feed on fungal spores or pollen. So far around 5,000 species have been described.